The MT is guided by the AM on winter bonus issues. So if you think the bonus elevation for E7 is not appropriate please petition your AM, Žaro @E73DU, and if he agrees he can discuss it with us. Dear OM Simon, I hope you’ll be glad to know that comrade Vasily Iosifovich Dzhugashvili just called and expressed his greatest pleasure with the fact that the spirit of his time still lives in a small brotherhood of SOTA devotees. Your “comrade” ran a command economy. What he said was right, no matter how wrong it was. Perhaps you would rather have that than the MT conferring with the AM who can be assumed to have better local knowledge than members of the MT. If so, be prepared for the gulag! I find this sort of thing irritating if not downright annoying. If you find a problem why not just communicate it quietly to the people in a position to do something about it, instead of making a parade of your superior knowledge and wisdom on the reflector? Only last night I remarked the Caroline (and she can witness): “We should report this privately - they’ll take the hump if we post publicly”. that some “more equal” members of the SOTA community have been trying to inflict on us, ordinary SOTA creatures. Perhaps you would rather have that than the MT conferring with the AM who can be assumed to have better local knowledge than members of the MT. If so, be prepared for the gulag! After all, it looks like we should be prepared for the gulag, my friend. So what are you saying, Zoran? Do you advocate that the MT should take unilateral action on complaints about the parameters of an Association without consulting the AM? What should the basis of such action be, then? Listen to the loudest complainer? Base our actions on the data in wiki - which is notoriously unreliable? Have a quiet word with your tourist board or the equivalent? If you want something from us, spell it out, don’t play guessing games with us, but bear this in mind: This year we brought nineteen new Associations into being, that is a lot of effort from volunteers, and it does not leave a lot of spare time to micromanage the other 137 Associations, which is what you appear to be advocating. We also set aside a certain amount of capacity each year to go through the summit lists of selected old Associations, to see if they need changing in the light of the more modern tools and data available to us now. In view of this continuing work load, you should not be surprised to learn that many of those working on the expansion of SOTA just don’t have the time to read the Reflector - far from being “people-silencing” my intervention was in recognition that these points on the Reflector were unlikely to be read by those who could act on them and were wasted where they were. That seems foolish to me. Take me as an example, I am in my late 70’s and nowadays only do a few activations in a year, but does that negate my knowledge of British hills gained over sixty years of climbing and walking? Your AM took the effort to bring your Association into being, how much of that work did you do? I also got the reference in your “more equal” comment. Since you think that “Animal Farm” is relevant, have you ever read 3.12.1.7 on page 19 of the General Rules? just wanted to let you know that in austria the minimum height for the winter points is also 1400m. This is not a criticism of the powers that be in OE, but I must say that I do find it bizarre that the likelihood of sub-zero temperatures is used as the parameter for winter bonus points. Surely it drops below zero on summits below 1400m in Austria. Whether an activator chooses to operate in sub-zero temperatures is entirely up to them. 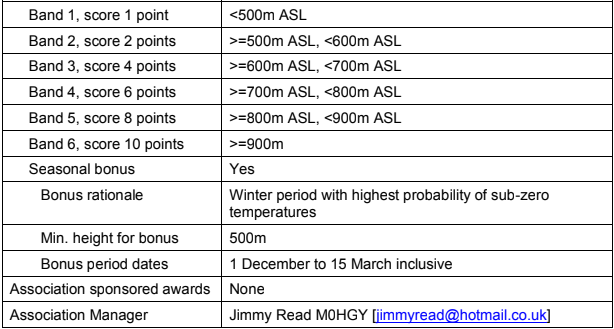 To my mind the winter bonus should be based entirely on the points rating of the summit and should be universal across all associations. No doubt others will disagree. Gerald, I have a feeling you have misunderstood their ruling; it looks to me as if it complies with your suggestion - 6 points and above. Doing thing by points doesn’t make as much sense for North America. The interior has weather very different from the coasts. The altitude range for regions varies, too. W4/WV-001 is a 10 point peak at 1746 m. A quick scan of the W0C (Colorado) association only shows two peaks shorter than that, W0C/RP-127 at 1623 m and W0C/UR-057 at 1709 m. The lowest point in Colorado is 1011 m.
It is of course a seasonal bonus option as defined in the GR. There are Associations with a summer bonus based on the likelihood of high temperatures, others with no bonus at all because of fairly uniform conditions throughout the year. We also enviseage but have not enacted a provision for a bonus in a monsoon season. As for universal across all Associations, the points rating is a very generalised measure of relative difficulty based on relative height and bears little relationship to the height at which icing up may occur, which is more related to the climate type of the Association. In short, it is too complex for simple solutions. just had a look at the G-ARM and found exactly the same words there! …it looks to me as if it complies with your suggestion - 6 points and above. Yes it does Rod. That is not my point - I was referring to finding the basis for the winter bonus being based on the likelihood of sub-zero temperatures somewhat strange. … had a look at the G-ARM and found exactly the same words there! Yes, equally strange. I have activated many single point sub-500m summits when the temperature is below freezing. No bonus points for those and I wouldn’t expect any. In short, it is too complex for simple solutions. Maybe, maybe not! The point is that when the OE Association was set up, that was the height recommended by the AM. As for the higher summits of the UK, I can tell you that many times I arrived in GM for a winter climbing holiday only to find no snow at all below about 1000 metres (those dreaded words - “You should have been here last week!”), yet some days later was anjoying a snowball fight on the beach! Continental mountains are to some extent more predictable but I have seen friends return from a ski resort with glum faces! Its weather, it does what it wants, and we do the best we can with bonuses. Why a winter bonus at all? It encourages activations during colder weather and shorter hours of daylight (none at all further north!) to try and get SOTA activity throughout the year (if only to make sure that Chasers don’t lose interest!) but without offering such a big bonus as to tempt Activators into taking silly risks. It seems to have worked, and that is the acid test. The way I read that, is that the “Bonus rationale” refers to the existence of a bonus, not the qualifying height. It is the “winter period” that has the highest probability of being sub-zero, not the height. The height factor, I surmise, is to limit the number of drive on, or otherwise trivial summits that could be activated for a bonus. Well if Austrian activators are happy to activate 1400+ metre 6 point summits in order to be awarded bonus points, then so be it. Personally I think we have it easier here in the UK being able to receive bonus points on much lower 2 point summits. Write 100 lines: " I must not forget that SOTA is not a level playing field across the associations". Personally I think we have it easier here in the UK being able to receive bonus points on much lower 2 point summits. But you are still not taking the hours of daylight into account. This is not insignificant. On the winter solstice, Vienna has about an hour more daylight than say Keswick, about two hours more than Inverness. Add in to this that the road head for a 6 point summit in OE will be at a respectable elevation, many if not most 6 point summits in GM and quite a few in the rest of the UK are climbed from near or at sea level. Geography itself abhors a level playing field, we do the best we can with the simplest approximations we can devise, and in general it doesn’t work too badly. So Zoran, did you activate all of your summits?! I have not seen your blog, or anything else about activations, except some of photos near some kind of colored stones… Please, keep your interest about SOTA on the way, and if you have any doubt about MT in E7, contact to me, via well know mail address, and avoid this conversations, and via other communication with E7 MT. Thats reflect ham radio situation at all in B&H. Gulags are hirtorical category, and if you have problem about E7 SOTA, you have problem in your head. Thank you!! 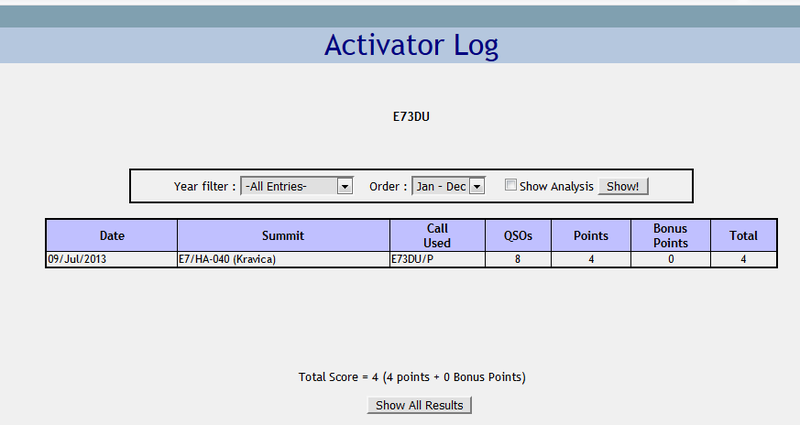 For other on this post, all sugestions about E7 SOTA peaks, gone from Zoran via Simon, to me, and thats isnt correct way! !